ECIL is stand for “ Electronics Corporation of India Limited”. This organization is one of the leading Public Sector Enterprise under Department of Atomic Energy of India. ECIL Recruitment department is looking for the energetic and result-oriented employees for the following positions purely on contract basis for various project sites spread over across the country i.e. Odisha, Chhattisgarh, Bihar, Jharkhand, kerala, West Bengal, Arunachal Pradesh, Assam, Manipur, Meghalaya, Mizoram, Nagaland, Sikkim and Tripura, Andaman & Nicobar and Goa etc. More information about these Government jobs in India is given below in this article. 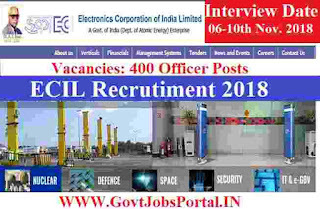 There are total 400 vacancies for two job profiles which are going to filled up through this ECIL Recruitment process 2018. Read out the complete article carefully before applying to these Government jobs in India. Pay Band: Rs.19,188 per Month. Pay Band: Rs.16,042 Per Month. Electronics /Instrumentation/ Electrical & Electronics / Computer Science and Information Technology” with minimum 60% marks can apply. Must have age less than 30 years for applying these Job profiles. Those who have an ITI certificate (2 years duration) in the following trade: “Electronic Mechanic/R & TV /Electrical and Fitter” can apply. Should have age less than 28 years for applying these job profiles. There is no need to pay any application fee for applying this ECIL Recruitment process. ECIL recruitment department is inviting all Indian candidates to apply for this recruitment process without paying any application fee. 06TH Nov. to 10th Nov. 2018 is the Interview Dates.